As a boy, Canadian physicist Richard E. Taylor was seriously injured by an explosion in the laboratory he had set up in the basement of his family's home, an event which, he has said, dulled his interest in chemistry and led him to pursue physics instead. He never earned a high school diploma, as he struggled with mathematics and illness kept him from attending classes. He studied physics at the University of Alberta, but that school offered no doctorate program so he was forced to migrate to America to earn his PhD. 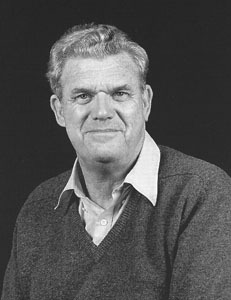 He was rejected on account of poor grades by the University of California at Berkeley, and instead attended Stanford, where he later taught and spent most of his scientific career. In collaboration with Jerome I. Friedman and Henry W. Kendall, Taylor conducted a series of experiments from 1967 to 1973, yielding results that were initially baffling, but eventually came to be understood as conclusive evidence that protons and neutrons are not fundamental particles of matter, but are themselves comprised of quarks, even smaller subatomic particles. The existence of quarks had been predicted but never previously established, and many scientists at the time held that quarks were perhaps mathematical fictions drawn from of symmetry patterns, or were real but so tightly entrenched and large (on the subatomic scale) that they could not be pried free for examination. Taylor, Friedman, and Kendall shared the 1990 Nobel Prize for Physics, for their work revealing the inner structure of protons and neutrons in the atomic nucleus.